"Some pieces feel like art projects as opposed to short stories proper... The book's extreme sentence style and structure feels like a meditation on consciousness, feeling, and of course, the absence of both." "Four easily digestible shorts fixate on fleeting incidents in the life of the young and fearful. ... Within a bland and insipid landscape, Martin finds moments of true sweetness." "If...you delight in the odd, the cerebral, the uncanny, and you love the possibility of language and the unexpectedness of the human brain, then by all means, go get your hands on a copy. Curious and perambulatory, these pieces are honest in the most endearing, unknowable ways. The Really Funny Thing about Apathy is a fun, fleeting romp through the strange language of the mind." “Ultimately, The Really Funny Thing About Apathy is a sassy, indulgent little book with more head than heart, but that’s part of its charm. I’d even go so far as to suggest that the balance and arrangement of its stories is pleasantly obsessive." 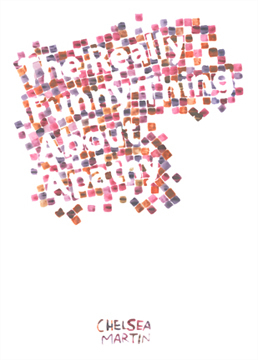 "The Really Funny Thing About Apathy is quite the read, and very highly recommended." In The Really Funny Thing About Apathy, Chelsea Martin’s charming but merciless prose employs mathematical paradoxes and theories of infinity to examine the inner workings of the bored and culturally over-stimulated while they idly consider the meaning of life. Overwhelmed and assaulted by their own inner monologues, these characters stumble through a series of external events, obsessing over the possible connections and ultimately assigning deep meaning to them.